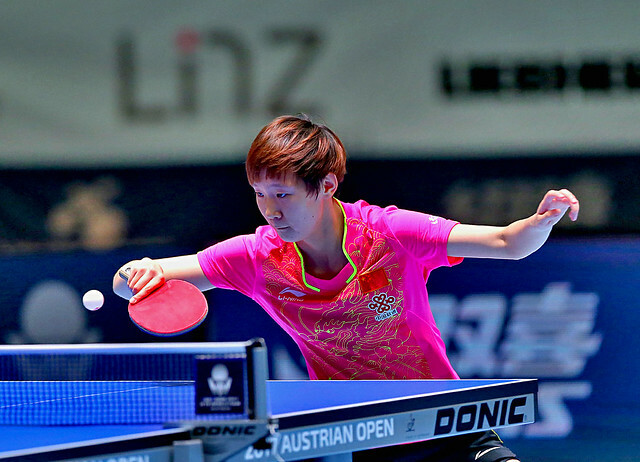 Success for China’s Fang Bo and Zhou Yu at the quarter-final stage of the Men’s Doubles event at the Seamaster 2017 ITTF World Tour Platinum, Hybiome Austrian Open in Linz on the morning of Friday 22nd September, likewise there was success in the counterpart Women’s Doubles competition for colleagues Chen Xingtong and Sun Yingsha. Both made it perfectly clear, whatever seeding may read, that they are the favourites for gold. Required to qualify, Fang Bo and Zhou Yu beat the host nation’s Robert Gardos and Daniel Habesohn, the no.8 seeds (11-6, 11-8, 11-6); Chen Xingtong and Sun Yingsha, the no.7 seeds, overcame colleagues, Chen Meng and Wang Manyu, the no.3 seeds (11-8, 17-19, 11-4, 11-9). An upset according to seeding but pairs from the same national association in opposition is very much a level playing field; however there was one major upset as play in the second morning began. In the Men’s Doubles event Hong Kong’s Ho Kwan Kit and Wong Chun Ting, the no.6 seeds, beat Japan’s Masataka Morizono and Yuya Oshima, the no.2 seeds (11-8, 11-6, 9-11, 11-7) and runners up earlier this year at the Liebherr 2017 World Championships in Düsseldorf. Ho Kwan Kit and Wong Chun Ting now meet Japan’s Koki Niwa and Jin Ueda at the semi-final stage; in the opposite half of the draw Fang Bo and Zhou Yu face Germany’s Ruwen Filus and Ricardo Walther. In the round of the last eight, Koki Niwa and Jin Ueda, the no.3 seeds beat Indian qualifiers Amalraj Anthony and Sathiyan Gnanasekaran (11-6, 14-12, 11-5); Ruwen Filus and Ricardo Walther overcame Sweden’s Anton Källberg and Kristian Karlsson (11-9, 11-9, 8-11, 11-8). Success for Hong Kong in the Men’s Doubles event, in the Women’s Doubles competition it was quite the reverse; two defeats at the hands of qualifiers. Doo Hoi Kem and Lee Ho Ching, the no.2 seeds, suffered at the hands of Japan’s Miyu Kato and Miyu Nagasaki (10-12, 11-8, 11-6, 11-8); Ng Wing Nam and Minnie Soo Wai Yam, the no.4 seeds, lost to the combination formed by Austria’s Sofia Polcanova and China’s Wang Yidi (11-9, 11-9, 9-11, 11-8). Sofia Polcanova and Wang Yidi now meet top seeds, Japan’s Honoka Hashimoto and Hitomi Sato, the quarter-final winners in opposition to Turkey’s Hu Melek and Austria’s Liu Jia (11-13, 11-7, 11-6, 11-6); Miyu Kato and Miyu Nagasaki face Chen Xingtong and Sun Yingsha.